Does it seem like your One Minute To-Do List (1MTD) or MYN system is bogging down? Does it seem like you have way too many tasks in your to do list? Because of that, are you no longer trusting or using your task list? If you exceed these maximums, the entire task system can bog down, and it’s time to clean things up. Otherwise, you are unlikely to review each section as often as you should, and then you’ll start dropping tasks and the system will fall apart — you’ll stop trusting it. Cleaning up the top two zones is pretty easy; just drag excess items down to the Over-the-Horizon section. Be aggressive about that. If you exceed the five, or 20 item limits in the top two sections, I guarantee the system will break down for you. So just drag items down to the Over-the-Horizon section (the low priority section), and get those two top sections cleaned up. Remember the two top sections are the items that you look at every day and so that list cannot be too long or else you will not use it anymore. What about the Over-the-Horizon section? Well, as you can see in the limits diagram, in 1MTD you should have no more than 75 items in the Over-the-Horizon section. The reason for that limit is that if you exceed 75 items you are unlikely to review that whole section once per week. Then, you’ll be afraid to put items down there since you never review it, and you’ll tend to leave them in the upper sections causing them to get overloaded. It becomes a cascading problem. To fix all that, start by cleaning up the Over-the-Horizon section so that you can start moving items from the upper sections there. To clean up the Over-the-Horizon section if you are using 1MTD, just delete as many tasks as you can—get the Over-the-Horizon section down to 75 or fewer items. If you can’t reduce the count below 75 because you feel that the items remaining in the Over-the-Horizon section are too important to delete, then it’s time to switch to MYN. 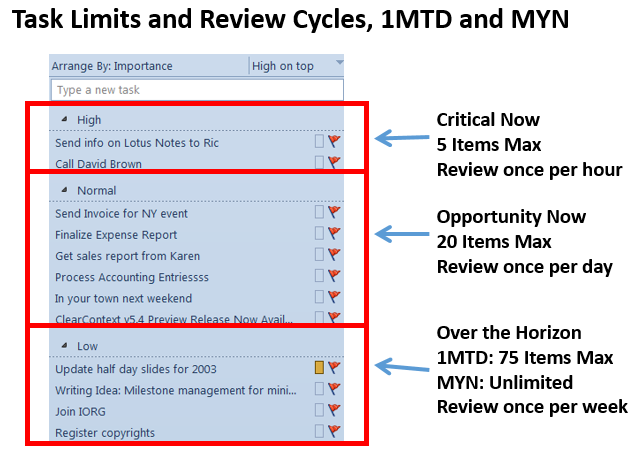 MYN can handle an unlimited number of Over-the-Horizon tasks due to its powerful Defer to Review feature. [2019 Update]: Or if you are not ready to advance to MYN (it does takes a little study) and just want to extend 1MTD a bit more, perhaps double its capacity, then use the lessons in the 1MTD Video Course (see Videos 9 and 10). Or use the corresponding videos in the Outlook Inbox Ninja Tasks videos (Lessons 4.9 and 4.10). So definitely consider that if you aren’t ready to move up to MYN. But in general, follow the guidelines in 1MTD and MYN, and the system is almost guaranteed to work for you. Thanks for your big enthusiasm with all this. Another iPhone app that I personally find much better than TaskTask is GoodTask from haha interactive. It integrates 100% with outlook through native IOS Reminders, it’s overviews are much better and highly configurable, it even integrates your calendar and you can put ToDo’s in between calendar items by setting StartTime on tasks as well.